英字新聞 : 'Achievement Gap' Closing Slightly for Young Students in U.S.
< Study: Do Fitness Trackers Help You Lose Weight? 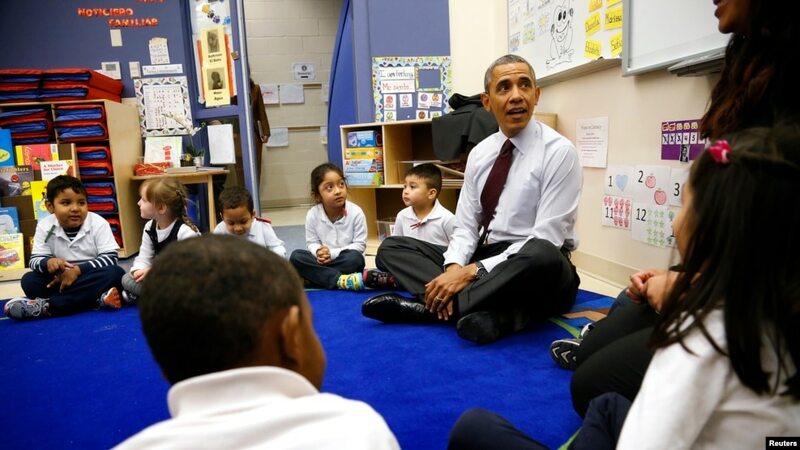 'Achievement Gap' Closing Slightly for Young Students in U.S.
United States President Barack Obama sits with 3- and 4-year-old students in a pre-kindergarten class at Powell Elementary School in Washington, DC, March 2014. It is no surprise that within many education systems, wealthier students often test better than poorer students. What is a surprise is that, in the United States, the achievement gap seems to be closing, at least a little. That result surprised researchers at Stanford University in California. Sean Reardon is a professor of poverty and inequality in education at Stanford. He studied children and how they prepare for kindergarten classes. He also looked at how their preparation has changed since the 1990s. Kindergarten programs are for boys and girls before they enter first grade. At this level, children need to demonstrate simple counting, an ability to listen and language skills. They need to be able to focus on a project and act responsibly in a classroom. Reardon found that from 1998 to 2010 the achievement gap closed a small amount. He said it was not a huge change. The important thing, he said, is that the gap is closing. One way to reduce the gap is to offer pre-kindergarten programs to very young children. Education experts and some politicians have long pushed for pre-kindergarten classes for all young children. In fact, it has been a promise heard on the political campaign trail -- universal pre-kindergarten classes for all 3- and 4-year-olds. Such classes are already being offered in some areas around the United States, including the U.S. capital, Washington, D.C. In fact, education reformers may want to look to Washington as a role model. Vincent Gray is a former mayor of the District of Columbia. When Gray was chairman of the D.C. Council, he wrote the legislation for universal pre-K. His measure gave parents of all children in Washington the choice to begin school at either age 3 or 4. Gray says he made sure the legislation was in effect and fully enforced during his four years as mayor. He was defeated for re-election, but is now a candidate for re-election for a seat on the D.C. council. Today, most of Washington’s youngest children are in school. Gray explains that the pre-K programs are not a requirement in the city. Parents can still choose what is best for their family. But many parents are choosing education. Pre-kindergarten classes for 3- and 4-year-olds offer hope for many youngsters. It is more than learning the ABCs or counting to 100. These classes give the youngest students the chance to learn how to listen, develop social skills, and interact with others. However, there are theories that say a child does not need schooling at the age of 3 and 4. If we are looking at test results, Finland beats the United States and most other countries in mathematics, reading and science. Yet Finnish children do not start school until age 7. Perhaps there is not a one-size-fits-all answer. Perhaps different children need school at different times. Generally, wealthier parents have more financial resources to help their children. Educated parents -- wealthy or not -- may know how to use the resources that are available to them. For example, they may take their children to free events at a public library or recreation center. Washington, D.C. also has many museums with free admission. Perhaps children who grow up with these types of activities don’t need to start attending school at age 3. However, children who are growing up in what Vincent Gray calls socio-economically challenging situations may not have access to such activities. For some families, he says, starting school at age 3 can be a game changer. Pre-kindergarten classes do more than educate the child. They also bring parents and caregivers into the schools. This point of contact, explains Gray, is a valuable time to educate families. A federal study found that, overall, parent involvement increased with such contacts. But it increased even more among low-income parents. It shows schools offer a place where conversations with these parents can happen. Anna Matteo wrote this story for VOA Learning English. George Grow was the editor. Отправились в отпуск, и занемог малыш, а деньжат маловато. Просто-напросто оформили ссуду онлайн, на пластик пришли денюжка мгновенно.Вернули спустя неделю уже дома. Никаких справок либо поручителей. Необходим только телефончик и кредитка с которой можно забрать всю ссуду буквально через несколько минут после одобрения заявки. Выручали подобные живые финансы и соседей, когда знакомому необходимо было срочно оплатить сессию. Ни одному человеку не надо толковать, унижаться и вымаливать. Лично подбираешь необходимую сумму и период отдачи. <a href=https://goo.gl/HQvoPM>Советую всем</a>, кто оказался в трудной ситуации.